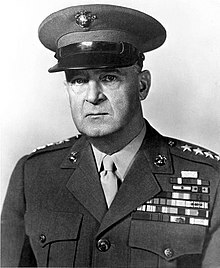 General Alexander Archer Vandegrift, USMC (March 13, 1887 – May 8, 1973) was a general in the United States Marine Corps. He commanded the 1st Marine Division to victory in its first ground offensive of World War II, the Battle of Guadalcanal. For his actions during the Solomon Islands campaign, he received the Medal of Honor. Vandegrift later served as the 18th Commandant of the Marine Corps, and was the first U.S. Marine to hold the rank of four-star general while on active duty. Alexander Archer Vandegrift was born on March 13, 1887 in Charlottesville, Virginia where his father of Dutch descent was an architect and contractor. Young Vandegrift, known as "Archer" in his boyhood, had an interest in the military – both from reading military history novels and from stories of ancestors who fought in various wars. He attended the University of Virginia for three years; then received his commission in the U.S. Marine Corps through a week-long competitive examination in 1908, becoming a second lieutenant on January 22, 1909. While at the Marine Corps Schools in 1909 he wrote a prophetic article entitled "Aviation, the Cavalry of the Future". As Commandant, he appointed the Hogaboom Board, named for Major General Hogaboom, the chairman, that began the USMC's development of vertical envelopment, the use of helicopters for air assault. During his early years as a second lieutenant, General Vandegrift was also very nearly dismissed from the Marine Corps due to disciplinary infractions and negative evaluations. In his first Marine Corps evaluation, dated June 30, 1909, Vandegrift received an overall rating of "Not Good" with these remarks from the Commander of the Marine Officers School. "This officer has not shown that he appreciates the responsibilities of his position as an officer, and unless there is a decisive improvement, his relations will not be to the advantage of the service." In Vandegrift's next evaluation, dated December 1909, he received a "Good and Tolerable" rating and next was rated as "Excellent" upon reporting to the Marine Corps Barracks, Navy Yard, Portsmouth, New Hampshire in 1910. Following instruction at the Marine Officers' School, Port Royal, South Carolina, his first tour of duty was at the Marine Barracks, Portsmouth, New Hampshire. In 1912, he went to foreign shore duty in the Caribbean, first to Cuba and then to Nicaragua. He participated in the bombardment, assault, and capture of Coyotepe in Nicaragua. Then in 1914, he participated in the engagement and occupation of Vera Cruz, Mexico. In December 1914, following his promotion to first lieutenant, he attended the Advance Base Course at the Marine Barracks, Philadelphia. Upon completion of schooling, he sailed for Haiti with the 1st Marines and participated in action against hostile Cacos bandits at Le Trou and Fort Capois, Haiti. In August 1916, he was promoted to captain and became a member of the Haitian Constabulary at Port-au-Prince, where he remained until detached to the United States in December 1918. He returned to Haiti again in July 1919 to serve with the Gendarmerie d'Haiti as an Inspector of Constabulary. He was promoted to major in June 1920. Major Vandegrift returned to the U.S. in April 1923 and was assigned to the Marine Barracks, MCB Quantico, Virginia. He completed the Field Officers' Course, Marine Corps Schools in May 1926. He then was transferred to the Marine Corps Base San Diego, California as Assistant Chief of Staff. In February 1927, he sailed for China where he served as operations and training officer of the 3rd Marines with headquarters at Tientsin. He was ordered to Washington, D.C., in September 1928, where he became assistant chief coordinator, Bureau of the Budget. Following duty in Washington, D.C., he joined the Marine Barracks, Quantico, where he became assistant chief of staff, G-1 Section, Fleet Marine Force (FMF). During this assignment, in June 1934, he was promoted to lieutenant colonel. Ordered to China in June 1935, LtCol Vandegrift served successively as executive officer and commanding officer of the Marine Detachment at the American Embassy in Peiping. Promoted to colonel in September 1936, Vandegrift reported to Headquarters Marine Corps (HQMC), Washington, D.C. in June 1937, where he became Military Secretary to the Major General Commandant. In March 1940, he was appointed Assistant to the Major General Commandant, and the following month was promoted to brigadier general. 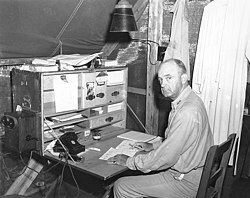 Brigadier General Vandegrift was ordered to the 1st Marine Division in November 1941, shortly before the United States of America entered World War II. He was promoted to major general in March 1942 and sailed for the South Pacific Area that May as commanding general of the first Marine division to ever leave the shores of the United States. On August 7, 1942, in the Solomon Islands, he led the 1st Marine Division in the first large-scale offensive action against the Japanese. For outstanding service as Commanding General of the 1st Marine Division during the attack on Guadalcanal, Tulagi, and Gavutu in the Solomon Islands, he was awarded the Navy Cross and for the subsequent occupation and defense from August 7 to December 9, 1942, received the Medal of Honor. In July 1943, he assumed command of the 1st Marine Amphibious Corps and commanded this organization in the landing at Empress Augusta Bay, Bougainville, Northern Solomon Islands, on November 1, 1943. Upon establishing the initial beachhead, he relinquished command and returned to Washington, D.C. as Commandant-designate. Vandegrift as Commandant of the Marine Corps. On January 1, 1944, as a lieutenant general, he was sworn in as the 18th Commandant of the Marine Corps. 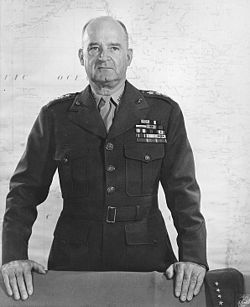 On April 4, 1945, he was appointed general, with date of rank from March 21, 1945, the first Marine officer on active duty to attain four-star rank. During his tenure as Commandant, the Marine Corps faced institutional threats from Army efforts to absorb the mission of the Marines. Though the Navy was sympathetic to the Marine Corps' predicament, it was ready to accept the diminishment of the Corps in exchange for keeping naval aviation from consolidation with the Air Force. The post-war discussions on the restructuring of the American defense establishment opened the door to diminishing the mission and role of the Marine Corps in the new defense structure. Proponents of such cuts included President Harry Truman and General Dwight Eisenhower. In this power struggle, the Marine Corps aligned itself with Congress, warning against the encroachment on civilian oversight within the Army proposals. The Marine Corps, then, believes that it has earned this right—to have its future decided by the legislative body which created it—nothing more. Sentiment is not a valid consideration in determining questions of national security. We have pride in ourselves and in our past, but we do not rest our case on any presumed ground of gratitude owing us from the Nation. The bended knee is not a tradition of our Corps. If the Marine as a fighting man has not made a case for himself after 170 years of service, he must go. But I think you will agree with me that he has earned the right to depart with dignity and honor, not by subjugation to the status of uselessness and servility planned for him by the War Department. For outstanding service as Commandant of the Marine Corps from January 1, 1944, to June 30, 1946, General Vandegrift was awarded the Distinguished Service Medal. He left active service on December 31, 1947, and was placed on the retired list on April 1, 1949. Together with Robert B. Asprey, General Vandegrift co-authored a book chronicling his experiences in World War II. The book is titled Once a Marine: The Memoirs of General A. A. Vandegrift Commandant of the U.S. Marines in WW II, and was published in 1964. General Vandegrift died on May 8, 1973, at the National Naval Medical Center, Bethesda, Maryland, after a long illness. His interment was on May 10, 1973 at the Arlington National Cemetery. For outstanding and heroic accomplishment above and beyond the call of duty as commanding officer of the 1st Marine Division in operations against enemy Japanese forces in the Solomon Islands during the period August 7, to December 9, 1942. With the adverse factors of weather, terrain, and disease making his task a difficult and hazardous undertaking, and with his command eventually including sea, land, and air forces of Army, Navy and Marine Corps, Major General Vandegrift achieved marked success in commanding the initial landings of the United States forces in the Solomon Islands and in their subsequent occupation. His tenacity, courage, and resourcefulness prevailed against a strong, determined, and experienced enemy, and the gallant fighting spirit of the men under his inspiring leadership enabled them to withstand aerial, land, and sea bombardment, to surmount all obstacles, and leave a disorganized and ravaged enemy. This dangerous but vital mission, accomplished at the constant risk of his life, resulted in securing a valuable base for further operations of our forces against the enemy, and its successful completion reflects great credit upon Major General Vandegrift, his command, and the United States Naval Service. General Vandegrift held an honorary degree of Doctor of Military Science from Pennsylvania Military College, and honorary degrees of Doctor of Law from Harvard, Colgate, Brown, Columbia, and Maryland Universities and John Marshall College. In 1982, the frigate, USS Vandegrift (FFG-48) was named in his honor. The main street that runs through Camp Pendleton is named Vandegrift Blvd in his honor. A former military housing complex, now civilian housing, for Wright-Patterson Air Force Base, near Dayton, Ohio, has streets named for World War II commanders including Gen Vandegrift, Gen Eisenhower, Adm Nimitz and others. Vandegrift married Mildred Strode (1886–1952) on June 29, 1909. They had one son, Alexander Archer Vandegrift, Jr. (1911–1969 ), a Marine Corps colonel who fought in both World War II and in the Korean War. He married, after Mildred's death, to Kathryn Henson (1903–1978). Vandegrift was portrayed in the 1960 film The Gallant Hours by Raymond Bailey, the 2006 film Flags of Our Fathers by Chris Bauer, and the 2010 miniseries The Pacific by Stephen Leeder. A fictionalized account of Vandegrift and the U.S. Marines on Guadalcanal is featured in The Corps series by W.E.B. Griffin. Vandegrift appears in the 2004 anime series Zipang. ^ Crocker (2006). Don't Tread on me. p. 298. ^ "USMC 4 Star Generals". The Warfighter's Encyclopedia. Archived from the original on November 5, 2004. Retrieved October 6, 2006. ^ a b Hoffman, Col. Jon T., USMCR (2004). "Chapter 18: Alexander A. Vandegrift, 1944–1948". In Millett-Shulimson (ed.). Commandants of the Marine Corps. p. 282. ^ Hoffman (2004). "Chapter 18: Alexander A. Vandegrift, 1944–1948". In Millett-Shulimson (ed.). Commandants of the Marine Corps. p. 283. ^ Millett, Allan R. (2004). "Acknowledgements". In Millett-Shulimson (ed.). Commandants of the Marine Corps. p. xiv. ^ a b Hoffman (2004). "Chapter 18: Alexander A. Vandegrift, 1944–1948". In Millett-Shulimson (ed.). Commandants of the Marine Corps. p. 284. ^ Vandegrift & Osprey, A.A. & Robert B. (1964). Once A Marine. New York: Ballantine Books. p. 63. ^ a b Aquilina, Robert V. "General Alexander A. Vandegrift". in Shaw (1992), First Offensive: The Marine Campaign for Guadalcanal. Retrieved January 1, 2009. ^ Krulak (1984). "Chapter 7: The Marines' Push Button". First To Fight: An Inside View of the U.S. Marine Corps. pp. 113–119. ^ Alexander Vandegrift (May 6, 1946). "Bended Knee Speech". Historical Documents, Orders and Speeches. History Division, United States Marine Corps. Retrieved January 29, 2009. ^ "General Alexander A. Vandegrift, USMC (1887–1973)". Naval Historical Center. United States Department of the Navy. Archived from the original on March 5, 2009. Retrieved December 19, 2008. ^ a b "Vandegrift Alexander Archer, Senior". Vandegrift Genealogy. Archived from the original on February 22, 2013. Retrieved January 1, 2009. ^ "Alexander A. Vandegrift, General, United States Marine Corps". ArlingtonCemetery.net. Archived from the original on January 13, 2009. Retrieved January 1, 2009. Crocker, H.W. (2006). Don't Tread on me: A 400-year history of America at War, from Indian Fighting to Terrorist Hunting. Crown Forum. ISBN 1-4000-5363-3. Millett, Allan Reed and Jack Shulimson, ed. (2004). Commandants of the Marine Corps (Illustrated ed.). Naval Institute Press. pp. 282–310. ISBN 978-0-87021-012-9. Retrieved February 2, 2009. Shaw, Henry I., Jr. (1992). First Offensive: The Marine Campaign for Guadalcanal. Marines in World War II Commemorative Series. Washington, D.C.: Marine Corps Historical Center, United States Marine Corps. Retrieved January 31, 2009. Ulbrich, David J. (2011). Preparing for Victory: Thomas Holcomb and the Making of the Modern Marine Corps, 1936-183. Naval Institute Press. ISBN 9781591149033. "General Alexander A. Vandegrift, USMC (1887–1973). 18th Commandant of the Marine Corps, January 1, 1944 – January 1, 1948". Naval History & Heritage Command, Department of the Navy. Archived from the original on March 5, 2009. "General Alexander Archer Vandegrift, USMC". Who's Who in Marine Corps History. United States Marine Corps. Archived from the original on October 7, 2010. Retrieved January 1, 2009. "MajGen Alexander Vandegrift, Medal of Honor, 1942, CO 1stMarDiv. Solomon Islands". Marines Awarded the Medal of Honor. United States Marine Corps. Archived from the original on February 22, 2007. Emberton, Keith D. (May 1, 1996). "Operational Leadership Once Beyond the Culminating Point: Perspectives on Calculated Tactical Risk to Achieve Operational Success" (Academic report). Joint Military Operations Department, Naval War College. Retrieved August 4, 2009.